For full details on how to get to the show click here. Axe Men, Fire walking, Chainsaw Carving, Inter Hunt Relay, Zog Trail, new for 2019 Chefs, Owls, Donkeys and Meerkat’s! Festival of food, fun, farming and music. To enter Cattle, Sheep, Horse and Pig classes, purchase adult or family membership click here. All other sections print off form and post. There are sponsorship opportunities to suit everyone. We are happy to discuss any sponsorship ideas to suit your needs and budget. The sun shone brightly on over 28,000 visitors to the Northumberland County Show on Spring Bank Holiday Monday. With the highest attendance recorded at the Bywell site since the show moved there in 2013, the organisers were feeling justly proud of their achievements. One happy visitor was Ian Murray, from Wooler. He and his father, Fred Murray, have been competing in the Youngs RPS Sheep Section for twenty years, selecting entries from the best of their 120-strong flock of purebred Texels. 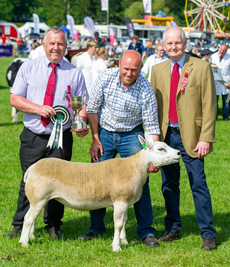 Ian was ‘Chuffed to bits!’ with his clutch of trophies for Male Champion Texel and Reserve, Female Champion, Group of Three and the Interbreed Championship, but the icing on the cake was when his gimmer was selected as The Champion of Champions. Plan an Amazing Day at the Show! Cattle, sheep, horses, pigs, alpacas, rabbits with Owls, Donkeys and Meerkat’s new for 2019. Music, singing, Gin & Prosecco bar. Climbing wall, tractors, soft play and more ..
Local food, traders and crafts & arts, with ‘have a go’ and finest livestock all set in Tyne Valley. The show is held at Bywell near Stocksfield NE43 7AB, just off the A69, A695 and A68 main trunk roads, approximately 15 miles west of Newcastle and 7 miles east of Hexham. For full details on how to get there please click here.